Spinal fusion increases stability in the spine and reduces painful symptoms caused by nerve compression. 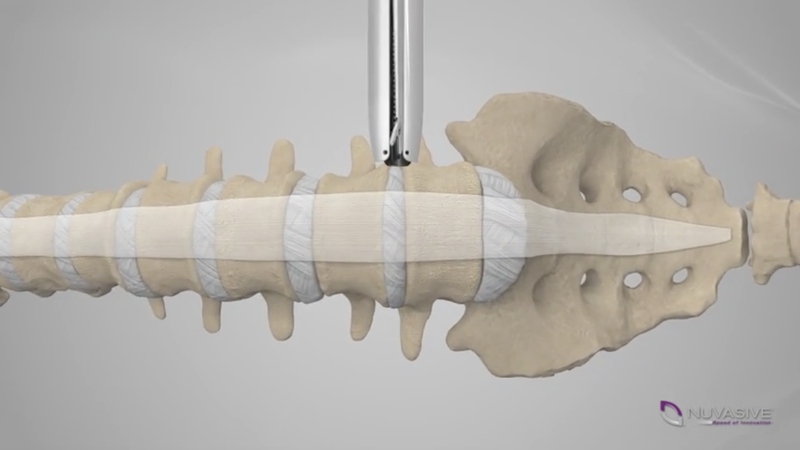 An interbody fusion is a surgical technique in which a disc in the front of the spine is removed and replaced with an implant. A cage or spacer is inserted in place of the disc to maintain normal anatomy and promote spinal alignment. Fusing two vertebrae stops abnormal spinal motion and associated nerve pain. Successful fusion of the vertebrae is further promoted by the insertion of bone graft or bone graft substitute in/around the affected vertebrae. Bone graft is a filler material used to replace bone, as well as stimulate bone growth following surgery. XLIF (eXtreme Lateral Interbody Fusion) is a relatively new minimally-invasive approach to the anterior spine that avoids an incision that traverses the abdomen and also avoids cutting or disrupting the muscles of the back. It can be effectively used for treatment of disorders such as degenerative disc disease, spondylolisthesis, and degenerative scoliosis. With this minimally disruptive technique, fusion can be accomplished through one or more small incisions in the patients’ side, instead of through a standard abdominal incision. Excellent access to the disk space is achieved from a very small incision on the patient’s side (flank), generally 30-40mm in length. The damaged disc is removed and replaced with a robust implant. Bone graft material is inserted to add support and promote fusion. Fusion surgery is usually recommended only after non-operative therapies have failed. XLIF is a revolutionary technique that lowers the risks of complications normally associated with spine surgery. Only for those vertebra of the spine that have clear access from the side of the body, this technique typically allows a shorter hospital stay and may be less painful than traditional approaches to the spine allowing a more rapid recovery and return to activity. Dr. Stieber has undergone advanced training in this technique and is on the leading edge of the use of this special minimally-invasive procedure.